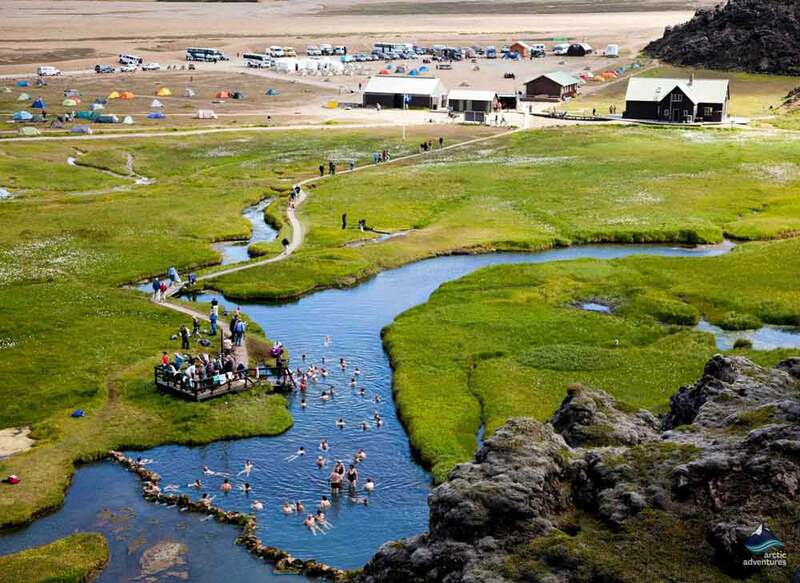 Hike in untouched Icelandic nature before bathing in a hot spring located under a lava field. A hiking adventure of a lifetime. 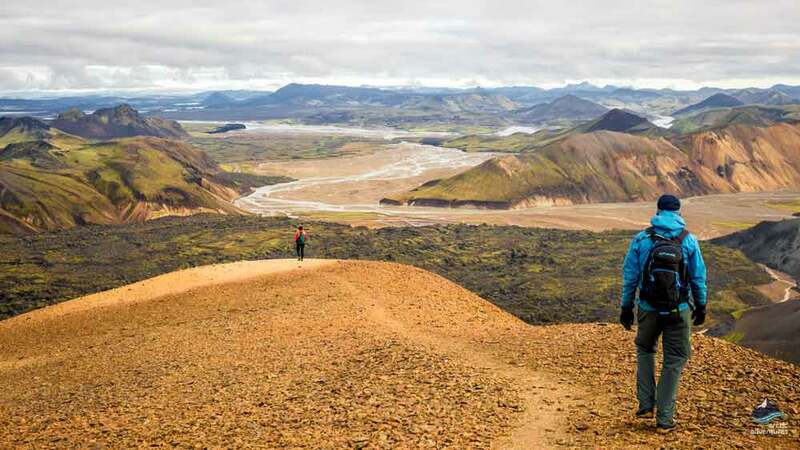 Landmannalaugar, every nature lover’s dream with untouched stunning nature, geothermal energy, colorful mountains, canyons and hot springs. Landmannalaugar is truly a unique area located in the Southern Highlands of Iceland. The iconic Mount Brennisteinsalda and Bláhnjúkur, with its blue and green colors mixing with lava, ash, moss and iron, form the most stunning painting-like background. 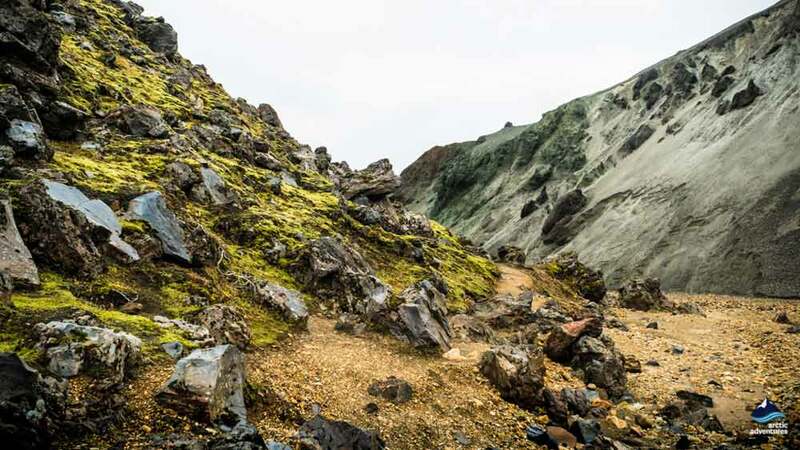 The moss covered lava of Laugahraun lava field will leave you in awe and the endless vast scenery will stay in your memory forever. 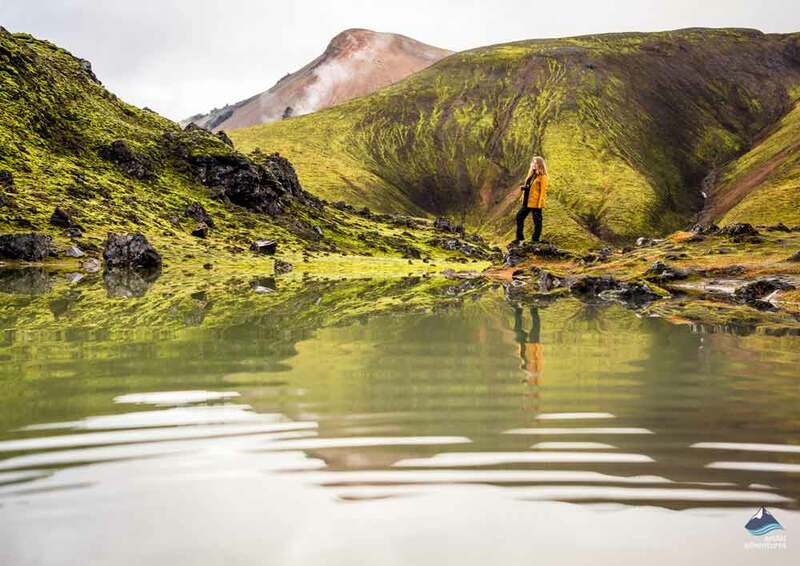 This is the perfect hiking location and a wonderful day tour out of Reykjavík. Don’t forget to bring your bathing suit, we end the day with a nice dip in the natural hot pool before heading back. 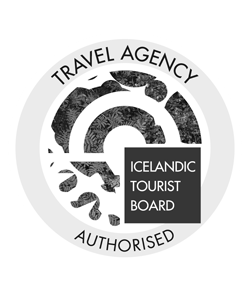 Landmannalaugar is located in the southern parts of the stunning Icelandic Highlands in a place called Fjallabak Nature Reserve. This remote location was originally where the settlers used to bathe when making their way over the land. 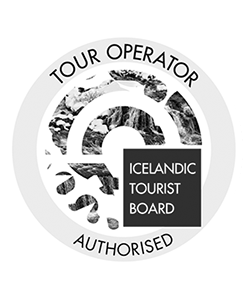 In more recent years it has been a favorite among adventure seeking Icelanders and now you have a chance to visit this extraordinary place. 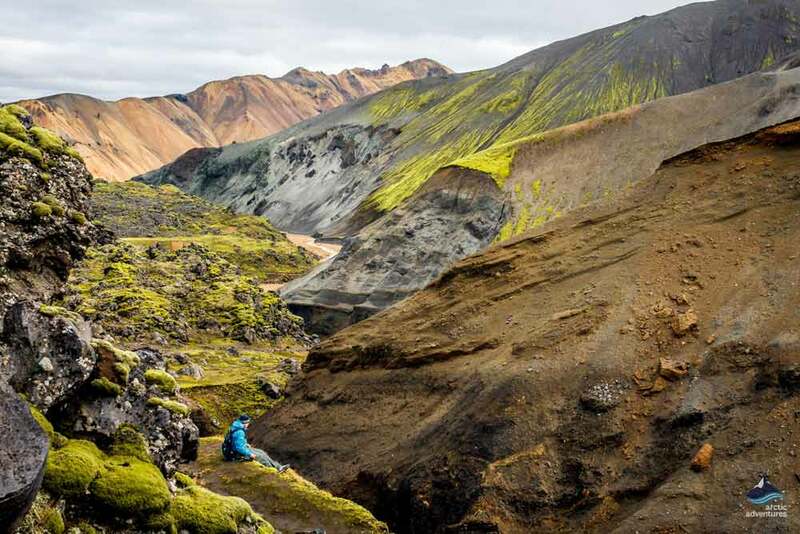 Landmannalaugar is a very geothermally active and as a result the area is surrounded by incredibly colorful mountains of Rhyolite, the most prominent being Mount Brennisteinsalda and Bláhnjúkur. It’s known for its natural geothermal hot springs and you can find steam rising from the ground in multiple places. Laugahraun lava field covers a great part of the area. It was originally formed around 1477 in a volcano eruption. 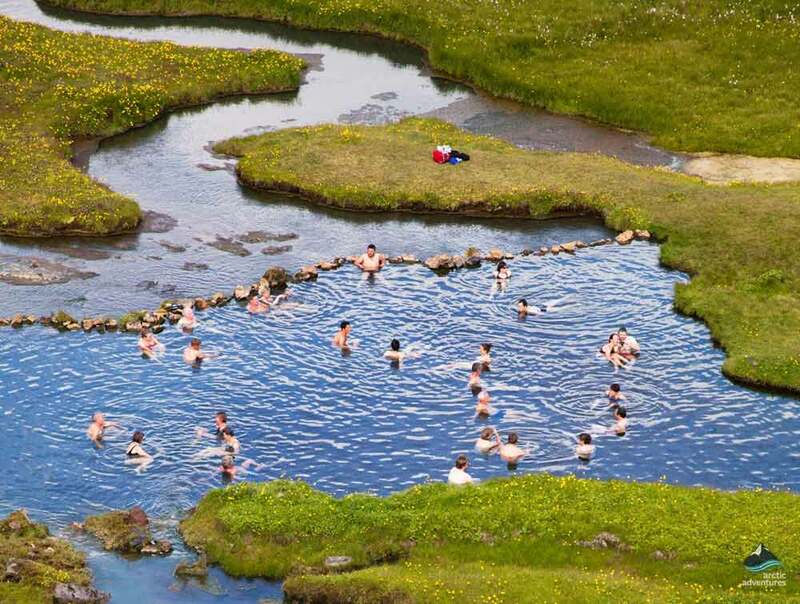 Right under the Laugahraun lava field is a wonderful natural hot pool that is popular for bathing after a good day of hiking. 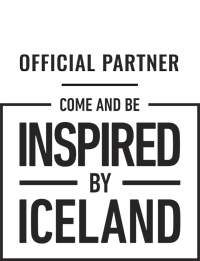 A 4*4 Highland Bus will pick you up at your selected location and head south. After a scenic drive from Reykjavík along the south coast, we turn inland off the main road to Fjallabak. The landscapes along the way are quite magnificent making the drive an experience in its own, a bit of a bumpy one as well. The hiking trail starts at the main hut in Landmannalaugar and from there we take off on a hiking adventure for about three to four hours. The total hiking distance is approximately 8-10 km, stunning from start to end. The route goes over Laugahraun lava field, through Vondugil canyon and up to Mt. Brennisteinsalda a multicolored peak that is highly characteristic for the area. On the way down you will walk down Graenagil gorge, called Green Gorge in Icelandic because of the dominant green color of rhyolite in the area. 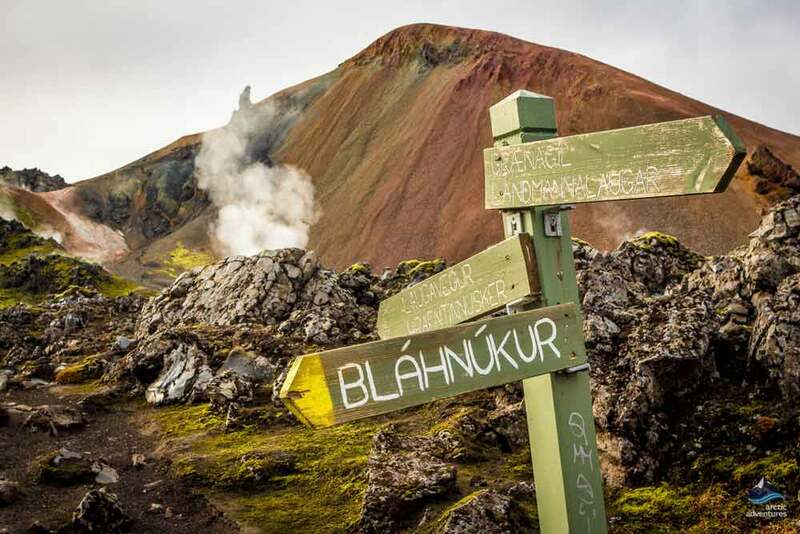 If time allows, we will summit the memorable Blahnukur Volcano before soaking in the hot pool in Landmannalaugar all whilst breathing in the breathtaking surroundings of this phenomenal place! Remember to bring: It is extremely important to have warm outdoor clothing, waterproof jacket & pants, headwear and gloves. Good hiking shoes are essential on this tour. Sturdy hiking shoes, waterproof jacket, and pants can be rented beforehand if you contact us or book online. Last but not least, don’t forget your bathing suit and towel! What type of transportation is used on this tour? Will there be stops along the way to purchase a lunch? 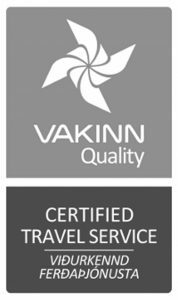 We use a 4*4 highland bus company to transport us to the amazing Landmannalaugar and yes, we will be making a short restroom break at a roadside shop where you can also purchase a lunch to bring on the tour. What is the distance and elevation gain? We hike about 8 km. which is around 4 hours of hiking including a lunch break. The elevation gain is about 4-500 m. going to approx. 890 m. above sea level.